Each year I relish the opportunity to write this report. It allows me both to pass on the past year’s progress and, on behalf of the Board of Directors of Tabitha Foundation (Canada), to thank you all very warmly for your contribution to our extremely successful work in transforming dreams into realities in Cambodia. There is precious little in the way of good news in the world these days, so it is a very pleasant task each year to inform you, our faithful supporters, of the heartening and yes, astounding progress being made by Janne Ritskes and her brainchild, the Tabitha Foundation. Janne, as Director of Field Operations, reports that 36,189 families with 289,512 dependents (up over 10%), were involved in our community development programs last year. 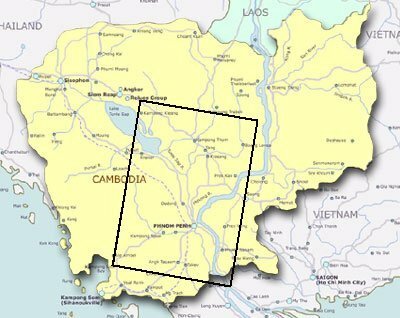 In 2007-08 Tabitha began operations in Cambodia’s Battambang province and approved expansion into Koh Kong province at the request of the governor and several local chiefs. In a piece of amazing news, the work in Kompong Som province will be closing down because the level of poverty has decreased significantly! The cottage industry program continues to provide work for some of the most destitute Cambodians, especially women. It allows them to work at home, while they care for their children. Profits from cottage industry support much of the administrative costs of the other programs in Cambodia. An amazing 888 houses were built in the past year by 79 teams with a total of 2370 volunteers (up 277 houses and 345 volunteers from last year). These house-building trips give Tabitha many of its most enthusiastic and solid supporters. In an entirely new project, in conjunction with PACE, six classrooms were built in Prey Veng allowing 380 more children to go to school. The well digging program saw 1045 (up from 48 last year) wells dug for 4,421 families with 35,368 dependents this year. Additionally, 6 ponds were built, providing water for 689 families in areas with no ground water. Provision of potable water for drinking and vegetable gardens is one of the most important initiatives to help families in need, in a nation where only 10% have good water. As in all charitable endeavours, it is you, our faithful and generous donors, who provide the funds necessary to operate these wonderful programs. All of us thank all of you so much. Tabitha Foundation (Canada) received over $206,000 in charitable gifts this last year, a more than 30% increase from 2007. Our dedicated all-volunteer Board here in Canada and the many additional volunteers helping us have, because of their combined efforts, allowed nearly all funds raised to go directly to aid the work in Cambodia. This is so very important for you as a donor that I know you will join me in giving them a huge and well-deserved “Thank you.” I give special thanks to the close-knit group who regularly attend our meetings and deal with the mundane business of running the charity. This year I would like to especially thank two of our most important board members. Jim Kirch is retiring as our treasurer after 10 years of guiding us so well in that capacity. He has done an outstanding job keeping our books, dealing with government regulations, satisfying auditors, and giving us solid financial advice. Another person without whom the ship would have sunk long ago is Mollie Stokes, our secretary since 2001. It has been to her that much of the work of running the foundation has fallen. She has consistently risen to the occasion and done more than her share to make sure the day-to-day operations of the foundation have run smoothly. As we have grown her workload has increased, as have her skills in dealing with it. It has been a pleasure for me to work with both Mollie and Jim. Let’s hear a big round of applause for both of them! The Canadian Board of Tabitha is pleased to welcome Bob Carver from Ottawa and Maureen Rice from Calgary to our fold. Bob has headed the Rockin4Tabitha events and house-building initiative for several years now and has become increasingly involved with the Board here in Ottawa. Maureen has been involved with Tabitha as a house-builder and board member in Singapore and now becomes the Canadian board’s Alberta representative. This June, Janne Ritskes and her daughter, Miriam, will be coming home for a family wedding and some well deserved rest. While she is here, she will be featured in an event in Ottawa (see newsletter) and also in events in Toronto and Hamilton. Please check our website at http://www.tabitha.ca to get more up-to-date information regarding these events, as well as updates on the field work and programs, a cottage industry catalogue, and links to our four sister foundations. If you would like us to email you the monthly field reports and updates, please send us your email address. We would be pleased to add you to our private distribution list. Janne Ritskes and her capable, all-Cambodian staff continue to produce miracles in the poverty stricken areas of Cambodia. We thank Janne, her staff, and the government and people of Cambodia, who have embraced and supported the goals of Tabitha. And once again I thank each donor. Please send your prayers along with your donations. May we all continue together, in grace, with this work in the coming year. The table below shows how life is improving for the villagers in Choum Pouk. The data show that there is hope, despite the increasingly evident scourge of HIV and AIDS. Education in health issues is an important part of Tabitha's work. Along with the table are notes from Janne Ritskes, Tabitha Cambodia's soul and inspiration, not to mention project chief. As the time of year draws near to planning for our next program year which begins in October – we begin the process of evaluating our past work. It is a time of renewal and thanksgiving, a time for recognizing our weaknesses and celebrating our strengths. It has been and continues to be an extraordinary year. A year of consolidation and understanding; a year of forming long term sustainable programs; a year of growth. So how best can I begin to describe what is accomplished? These are just a few samples of what we evaluate each month and year - the progress is astounding. What is not measured is the psychological impact on the people - when we start; the families are defeated and so very tired. To see us coming was difficult for them - it is so very hard to listen to hope when one feels none; it is so very hard to believe in oneself when experience says that achievement can be removed at a moment’s notice. It is so very hard to measure the courage they need to believe in oneself and in one’s family. How do we measure the smiles and enjoyment at our visits now? How do we measure what it feels like to be welcomed as family - how do we measure the sharing of every aspect of their lives? In one way, it is easy - for it is a joy and a privilege to visit. It is easy to measure the lessening of physical and emotional abuse within the families - drops from 83% to less than 5% over several years in all our communities. It is a privilege to seem walk with head held high, with mischief and life in their eyes, with banter and snacks at each visit. No staff takes lunch to the area - the families take pleasure in feeding them. Choum Pouk Eyke doesn’t want us to leave - a couple more years they plead - we would like wells and kitchens, we would like toilets and sturdy houses - we can do it if you stand with us - and the new families that want to join - what about them - the ones not easily accessible - the ones living in the back of the fields - they too, need your help. And so we stay for a couple of more years. How do we measure you? You who stand with us in this work? You, who are our friends and our partners? How do we evaluate your help, year after year? Your financial support, your volunteering, your prayers and concerns for us. How do we measure it? We measure this through the thousands of faces that greet us - that show us what they have done - that share what they want to do - that care for us as we care for them. We measure it in the new communities we enter each month - we measure it in being able to stand with them year after year. We evaluate all of you in the innumerable blessings and accomplishments of so very many. I thank God that He has enabled all of us to do so very much and I am filled with thanksgiving and privilege at what He will enable all of us, families, staff, friends and partners, to do in the coming year. 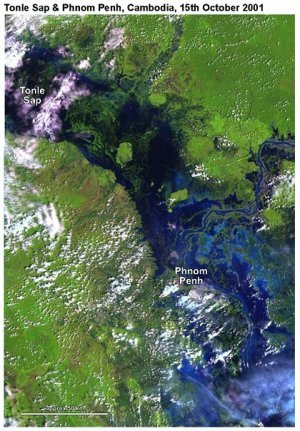 The satellite image to the right shows the extent of the devastating flooding Cambodia has undergone in both 2001 and 2002. Normally, this area is not under water. You can see the Mekong River's usual channel coming in from the right and snaking down to the left to Phnom Penh, the capital; then flowing back to the right and down into Vietnam. From Tonle Sap, a lake in the upper left, comes the Tonle Sap River, whose channel you can see coming down to Phnom Penh from the lake. This is normally a smaller river than the Mekong. While flooding is an annual event in Cambodia (in fact, agriculture and fishing depend on it), the floods have been very bad this year and last. Many have lost homes and livelihoods. Please help. See how at our website at http://www.tabitha.ca. of the satellite image to the left. The Royal Cambodian Embassy in Washington, D.C.